After you’ve segmented your focus groups, like we discussed in part 1: explore your target audience, the next step is to analyse your focus groups. You want to know and understand how these groups think and how to influence them. You’re going to map the customer in as many useful ways as possible. Look at online and offline behaviour. In every single situation you have to decide which way of customer research works the best for your business and blog. In part two of the business blog series, we’ll explain these techniques to map your focus groups so you can start using them as a preparation for your own business blog. Mapping your focus groups can be done in many different ways. You can map extensive information but also very basic information. It’s important to be studious but also don’t do too much! The most important thing while mapping the characteristics of your focus groups is to look at the quality of the information, not the quantity. You can’t use information about how many books someone has if you own a fast food company. So try to focus on finding useful information you could use in your business blog. To make sure you’ll search for the right information, it could be useful to draw up some guidelines and limitations to the information you’re going to look for. What do you want to accomplish by using your business blog? What do you want to know about your focus groups to reach them the way you want to? What are their interests and characteristics you can use? And if you want to sell something to your business bloggers, what do they want to know while they decide which product to buy? After the target audience research, Gerard decided to focus on the focus group ‘dog owners’. He made this choice because he doesn’t have the time and money to target more than one group at once on his own. The next step is to find out how can reach this focus group. To get some inspiration, Gerard made a list of every article he could sell to this group. Also, Gerard wants to know where he can find this group and what they do in their daily life, online and offline. He asks himself: “What characteristics do the members of this group have in common?” Also he wants to know how ‘small dog owners” differ from “big dog owners”. The customer journey is a mapping technique that can be used to gather the information you want about your focus group. But, besides the customer journey, you could also decide to make a persona or empathy map to start with. The combination of techniques that is most effective is different in every situation and changes with the guidelines you’ve drafted. 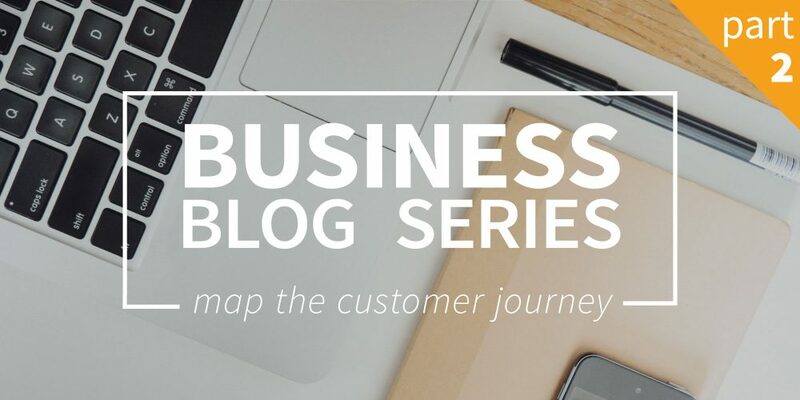 In this part of the business blog series we’ll focus on the customer journey. This technique is used as a guideline for your content calender. The customer journey can be used in many different ways. In this situation, while creating a base for your business blog, it’s important to look at the start of exploring needs till the end where you evaluate the product. To get inspiration for the subjects you want to write about, it’s important to focus on content, not so much on promotions like the example. But the phases; awareness, consideration, purache, retention and advocacy, can be a good starting point to decide what kind of subjects your focus group would ook for. After brainstorming, updating and structuring, you’ll end up with a final version of your personal customer journey. In this final version you have to make sure you get a schematic overview of all the information you’ve collected. What this overview looks like is different in every situation. You decide by yourself which information you need and how to create a good base for your business blog. Gerard decided to make only a small summary of all the outcomes of his brainstrom session. This summary serves as a guideline for the next steps he will take. 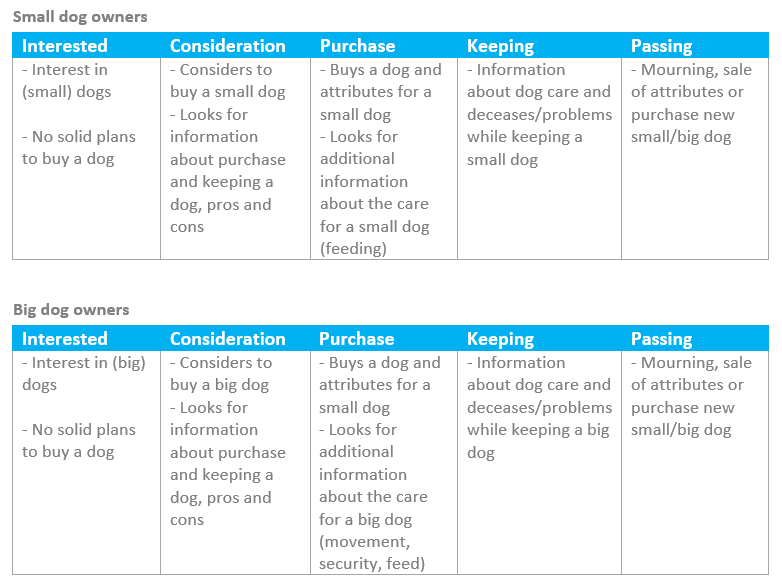 Once you’ve got a clear overview of the customer journey, the next step is to choose keywords / subjects. In this part of your business blog preparation you will connect your own findings with concrete words you want to write about. Want to know how to choose the right keywords for your business blog? Read our next part of the business blog series: Business blog part 3: Do keyword research.